Following the final poster that star Jennifer Lawrence shared yesterday, Lionsgate has released the first clip from The Hunger Games: Mockingjay Part 2, in theaters November 20. If that wasn't enough, Entertainment Weekly has released the cover for this week's print issue, which features Jennifer Lawrence as Katniss, Liam Hemsworth as Gale and Josh Hutcherson as Peeta, along with eight new photos. The clip gives us a tiny taste of life in District 13, although it does bring some unexpected changes for Katniss. The clip shows Katniss reuniting with Finnick (Sam Claflin), before they are joined by their new commanding officer, Boggs (Mahershala Ali), who has special orders for Katniss, Gale and Finnick. Cressida (Natalie Dormer) reveals that they will all be the "on-screen faces" of this war against The Capitol, since it has been decided that they are more effective when seen by the masses. This scene also gives us a new look at Lt. Jackson (Michelle Forbes), Boggs' second in command, along with Messalla (Evan Ross), Pollux (Elden Henson) and Castor (Wes Chatham). With the nation of Panem in a full scale war, Katniss confronts President Snow (Donald Sutherland) in the final showdown. Teamed with a group of her closest friends - including Gale, Finnick, and Peeta - Katniss goes off on a mission with the unit from District 13 as they risk their lives to stage an assassination attempt on President Snow who has become increasingly obsessed with destroying her. The mortal traps, enemies, and moral choices that await Katniss will challenge her more than any arena she faced in The Hunger Games. The cast also includes Julianne Moore as Alma Coin, Stef Dawson as Annie Cresta, Patina Miller as Commander Paylor, Robert Knepper as Antonius, Gwendoline Christie as Commander Lyme and Eugenie Bondurant as Tigris. Francis Lawrence, who directed The Hunger Games: Catching Fire and The Hunger Games: Mockingjay Part 1, is directing from a script by Danny Strong (Lee Daniels' the Butler). 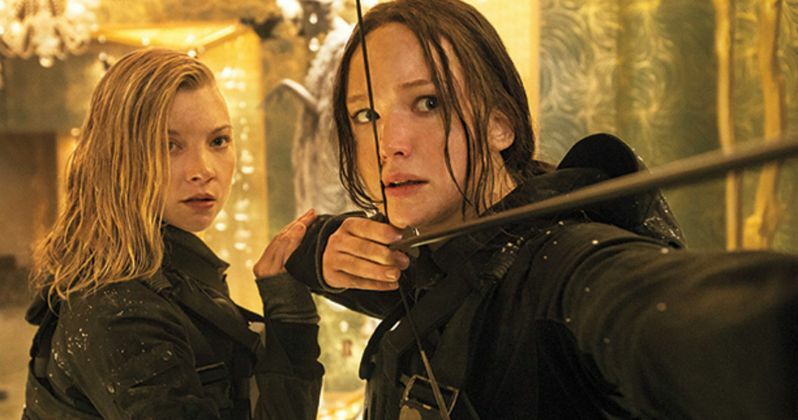 This highly-anticipated sequel brings an end to this franchise, based on Suzanne Collins' novels, but we'll have to wait and see how long it will be for a prequel or a remake to be developed. The Hunger Games: Mockingjay Part 2 will go up against Sony Pictures' The Night Before starring Seth Rogen, Joseph Gordon-Levitt and Anthony Mackie, and STX Entertainment's Secret in Their Eyes on November 20. Last year, The Hunger Games: Mockingjay Part 1 was the second highest-grossing movie of the year behind American Sniper, but this year, The Hunger Games: Mockingjay Part 2 will have to out-gross Jurassic World's $650 million domestic take. While we wait for more on this highly-anticipated sequel, check out the first clip and photos.